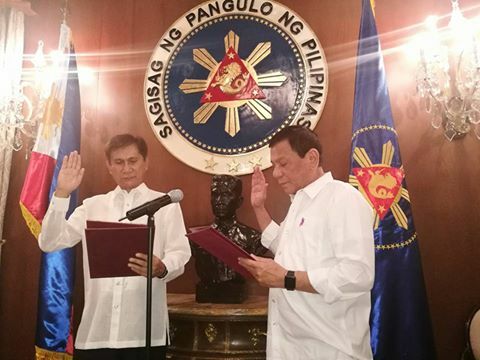 MANILA, May 8 -- President Rodrigo Duterte has appointed former Armed Forces of the Philippines chief and ambassador Roy Cimatu as the new Secretary of the Department of Environment and Natural Resources (DENR) replacing Gina Lopez whose nomination was rejected by the Commission on Appointments. "We are confident that Secretary Cimatu shall faithfully serve the interest of the country and the Filipino people in his capacity as the new DENR Secretary," said Palace spokesman Ernesto Abella in a statement. Prior to this, Cimatu served as the Philippines’ special envoy to the Middle East. Meanwhile, the Chamber of Mines of the Philippines (COMP) welcomed the appointment of Cimatu "with cautious optimism". COMP said Cimatu's sterling record in government service speaks well of him "and we hope that his appointment finally answers our long-held call for a DENR secretary who has a balanced appreciation for environmental protection and natural resources management."